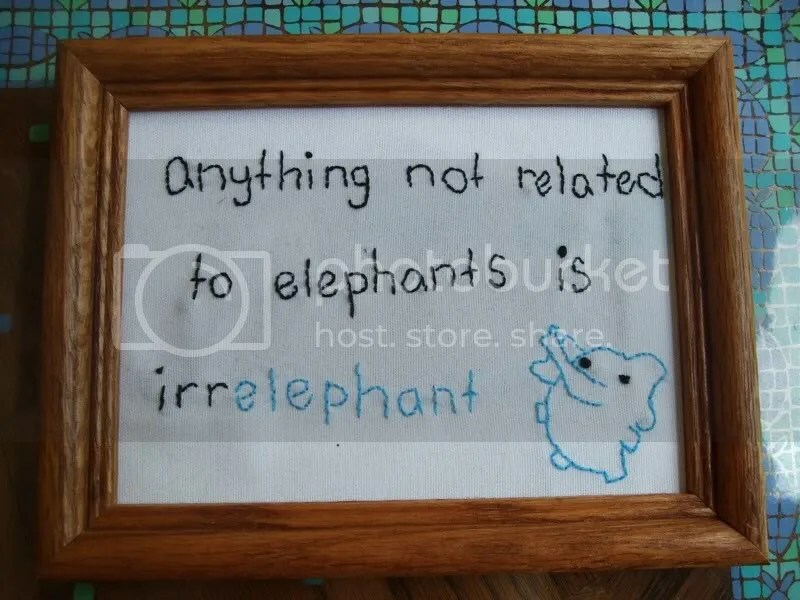 Irrelephant | Stitch, Brinn, Stitch! It’s mostly backstitch and some french knots cause that’s what I know how to do. The lettering is kind of wonky since it’s just stitched in my handwriting (I just wrote the words with a disappearing ink pen and stitched over them). This frame came with a piece of glass, so I had the brilliant idea of wrapping the cloth around the glass and fitting it inside the frame with the cardboard backing instead of using a separate piece of cardboard. It worked quite well if I do say so myself. I appear to have regained my knit mojo, so I’m back at it, but rest assured, I’ll be doing another punnerific embroidery soon. This one and the “alot” one I made before have very similar frames and style, and I have a couple of similar frames. I’m thinking of doing a set and hanging them together (y’know, when I have a place of my own to hang them in), so if you have any suggestions for further pieces in the same vein, do let me know.